What is the Difference Between Blackjack and Other 21 Games? This is one of those questions that keep appearing in gambling tables or gambling conversations. And, I must say it is one of those valid questions since there are so many variations of Blackjack. Most people know how to play Blackjack and excel at it, but what’s up with the one hundred types of variations? Just kidding! They are not so many, but indeed they are a lot. Let’s talk about the five main variations of “the other 21 games” and I will try to be as clear as possible in stating their differences. European Blackjack is a variation of Classic Blackjack and is the same as the original game that you were probably taught. In this game, Blackjack always beats any other hand with a value of 21 and all face cards – Kings, Queens and Jacks of any designation have a value of 10. Aces have a value of either 1 or 11. During game play, a player can request to be “hit” in order to obtain up to nine additional cards. The Dealer will stand on hands with the value of 17 and if his/her hand has a value over 21, it is a “bust” and the player automatically wins. When the player hand and the Dealer’s hand tie, even on Blackjack, this is known as a “Push”. Should the Dealer have Blackjack, both original and doubled bets are lost. 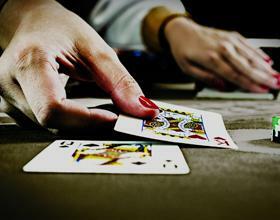 Insurance is offered on the players hand when the dealer’s initial card is an ace and all Wins are paid out at 3 to 2. This variation offers both single and multi-hand options. This Blackjack usually has one of the lower house edges at casinos. While it is very similar to Classic Blackjack, it is an American Hole Card game played with 8 decks of cards. The dealer has two cards at the beginning of the game and checks for blackjack and if he has it, the game is over before you can lose money by doubling. The dealer also stands on soft 17 in this game. In this game, you may double on any of the first two cards, and a double after a split is permitted. You are also able to then re-split cards into 3 hands and late surrender is allowed. Double Exposure Blackjack is very different from the classic versions of the game, being played with 8 decks of cards, with both of the dealer’s cards being dealt facing upwards. You would think that this would give you the advantage, but rules have been put into place to ensure that this isn’t the case, and in fact, create a house edge of 0.69%, which is one of the highest amongst the different blackjack variations. Within the framework of these rules, the Dealer wins all ties except on blackjack which pays 1 to 1. The dealer hits on soft 17. One card is required to split aces, and a player may re-split cards into four hands. Doubles are only permitted on hard 9, 10 and 11 and a double after a split is allowed. All player wins including blackjack pay 1 to 1. This Blackjack game is the same as European Blackjack, but features an added bonus option which means that this game usually pays out a great deal more than the other games at a casino. Blackjack is played with 2 decks of cards, according to original blackjack rules and if you bet on the “bonus” option on the table, hands of “Blackjack” featuring a Jack and an Ace of Spades pay out at 50:1, with Jacks of any other suit accompanied by an Ace payout at 25:1. Spanish Blackjack is an American Hole card game that is completely different to any other variation of the game due to the fact that it is played with 8 Spanish decks of cards which consist of 48 instead of 52 cards because the ten cards are removed. This gives the house a huge advantage if you don’t know all of the rules of game play. The dealer will peek on 10 and Ace cards for Blackjack and will hit on soft 17. In this game Player Blackjack and 21 beat Dealer Blackjack and 21 respectively. Late surrender is permitted and one may Double Down on any number of cards, as well as after a split but can only re-Double Down once. Player Surrender after Doubling Down is allowed. A player may split 3 times to make 4 hands, and Aces can be re-split. What do you think? Did I succeed at explaining the differences? If you have more to add, please feel free to add your comments in the space below.